In this lesson, children use each other's work. Divide the class into six groups. Give each group of children some white sheets, a saucer, one colour tempera paint, salt, brushes, a jar with water and blotting paper in a slightly darker colour than the paint. Mix tempera on a saucer with a lot of water to get a light (ice cream) colour. Each group paint a few sheets of drawing paper with this diluted tempera. Salt can be applied to create texture and small pieces of blotting paper with water will suggest chocolate chips or fruit in the ice. Be sure there are so many sheets of each colour that every student can get half a sheet of all six colours. 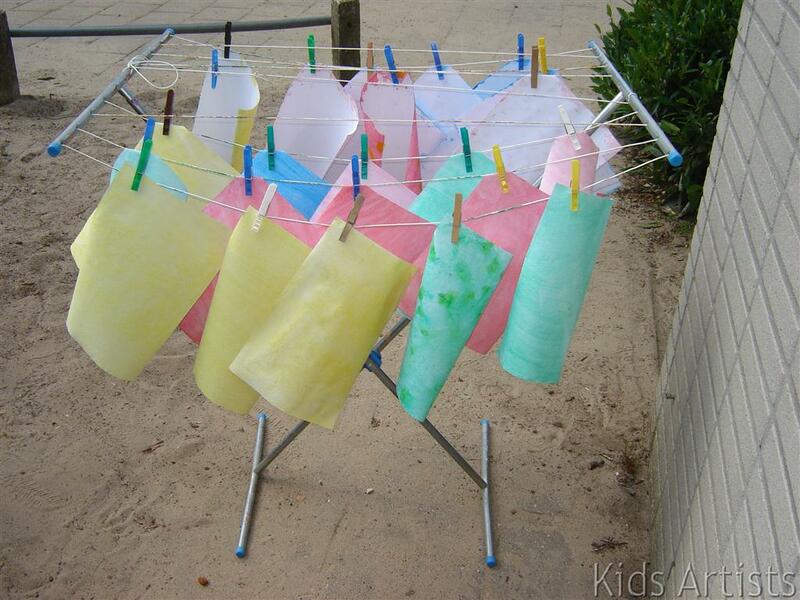 Hang the sheets outside to dry. Cut the large sheets of coloured cardboard lengthwise into three, so you get three large strips of approximately 15 by 60 cm. Give each child a coloured strip and a sheet of brown construction paper. Each student cuts a cone out the brown craft paper by folding the paper and cutting a triangle from the fold . Then the draw a wafer pattern on the cone with a gold marker. Give each student half sheet of painted paper of all six colours. Let them draw circles on the sheets by outlining a cup. Cut the circles. 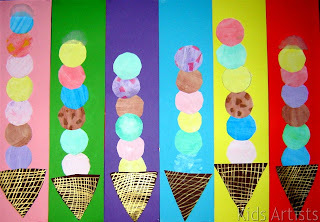 Paste the ice-cream cone on the large sheet of cardboard, and paste six different circles on it. Remember that the first scoop of ice cream has to be pasted partly in the cone. Finally cream may be added, by cutting half a circle out of fiberfill or some cotton wool. Op art line design 2: garlic cloves!